With growing aspirations of people to quit their jobs, implement novel ideas and come up with their own startups, there is definitely a startup boom in the society and business environment, but one shortcoming with increasing number of startups is affordable space. For every problem that arises, there are people out there with unique solutions. Similarly, to tackle the problem of space for entrepreneurs, 3 Hyderabadis came together and started the concept of coworking in our city. Coworking is a style that facilitates people from diverse backgrounds to work together in a common space. These occupiers, also called coworkers, are not necessarily employed by a single organization. 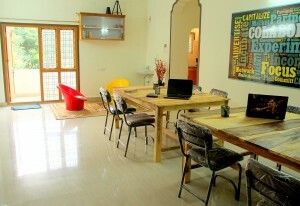 The group also comprises freelancers, travellers, startups and entrepreneurs. In the coworking style, people share values and are interested in the synergies that can happen from working with like-minded people in the same space. 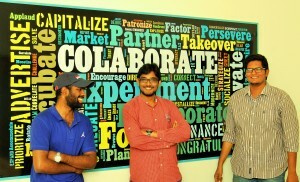 Three enthusiastic youngsters – Anurag Parepally, Vinay Peddinti and Raghuveer Kovuru took this concept as the base of their startup and came up with Co.Lab.Orate, which maintains the same global standards and values of community, openness, collaboration, accessibility, and sustainability. This firm aims at providing affordable space to independents, freelancers, travellers, indigenous startups and entrepreneurs thereby developing a self-driven community. Anurag Parepally is the space evangelist at Co.Lab.Orate. He is a qualified civil engineer from SRM Institute of Science and Technology, Chennai. Anurag has grown up in several parts of India and is exposed to multi cultures. Vinay Peddinti, the administrator at Co.lab.Orate is an Electricals and Electronics Engineer. An active sociopreneur, Vinay is the founder and president of an NGO, The Social Cause. Raghuveer Kovuru, is the community animator at Co.Lab.Orate. He holds an MBA in International Finance from IMT, Dubai and is also a law grad from NALSAR, Hyderabad. Prior to this, he has an experience of 5 years as a finance consultant with the Big4s like Deloitte and PwC. “Some months ago, when the three of us wanted to enter the entrepreneurial world with the intention of starting up, we searched for a place which would provide all the facilities required for a small time office but at really economical prices. Moreover, networking and interacting with people from various fields is really important for a growing company. There was nobody who could provide us the same in Hyderabad. It was either executive spaces or shared offices. We felt that coworking spaces are very rare to be found around us and there was a need to plug the gap, hence the idea of Co.Lab.Orate was born” narrates the co-founders when asked how they came up with this unique idea. The space at Co.Lab.Orate is entrepreneur friendly and proves to be an amazing place to work. This firm has adopted a friendly and informal environment thus allowing people to interact, learn, network and share information and experiences. 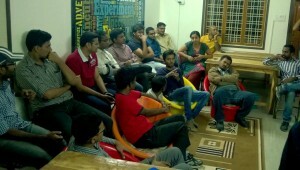 The in-house event and workshops also nurture and develop the entrepreneur in an individual. This coworking firm has an active floor of 3500 sqft with in house spacious lounges, pantries for cooking and small break out areas. The whole space available at CO.Lab.Orate can easily accommodate 50 people at one go. “We organize regular events and workshops on a weekly basis. The idea is to keep the startup mechanism active and running. An event a year or on a half-yearly basis does little in keeping the system active. Hence, we organize events of all kinds like discussions, technical workshops, debates, food meets and so on. All the events are free and everyone is welcome to be part of them because of the varied nature” says one of the founders. Co.lab.Orate is open from 9:00 AM to 7:00 PM on weekdays and 9:00 AM to 3:00 PM on Saturdays. It is quite easy to reach out to this firm as they are available on all leading social media platforms and people can walk-in to Co.Lab.Orate anytime. For enquiries people can reach them on 9985190004/06/02 or mail them at enquiries@colaborate.in.